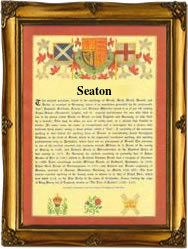 This interesting name recorded as Seaton and Seton and occasionally Sayton, is of locational origin. The Seatons or Seton's of Scotland descend from a place near Longriddry which is named after a Norman family who came over with William the Conqueror, but who were granted lands in Scotland. These were the "de Sey", and to their name was added the Olde English 'tun', to give 'the place of the (de) Sey'. The English Setons or Seatons derive their name from one of several places in Yorkshire, Devon, Durham, Cumberland or Northumberland, all on the coast . These originate from the pre 7th Century English words "sae" meaning sea and "tun", a settlement, the village by the sea. It is understood that several such 'Seaton' villages may have literally been washed away over the centuries by coastal erosion. Early English recordings include that of John Seeton in the Nottinghamshire Coroners Rolls of 1557, whilst in Scotland William Seaton married Anna Wallace at Lanark, Glasgow on June 11th 1696. The coat of arms has the blazon of a red field, a silver bend between six gold martlets, 'arms' which suggest that the holders were not people of property, but relied on their professional ability to succeed. Amongst the famous nameholders was Sir Thomas Seaton (1806 - 1876) originally a cadet in the East India Company army, who rose to Major General. He later wrote an autobiography of his experiences. The first recorded spelling of the family name is shown to be that of Alexander Setone, which was dated 1150, recorded in the book 'Early Scottish Records', during the reign of King David 1 of Scotland, 1124 - 1153. Surnames became necessary when governments introduced personal taxation. In England this was known as Poll Tax. Throughout the centuries, surnames in every country have continued to "develop" often leading to astonishing variants of the original spelling.